It’s been a year since Binti and Okwu enrolled at Oomza University. A year since Binti was declared a hero for uniting two warring planets. A year since she found friendship in the unlikeliest of places. And now she must return home to her people, with her friend Okwu by her side, to face her family and face her elders. But Okwu will be the first of his race to set foot on Earth in over a hundred years, and the first ever to come in peace. After generations of conflict can human and Meduse ever learn to truly live in harmony? 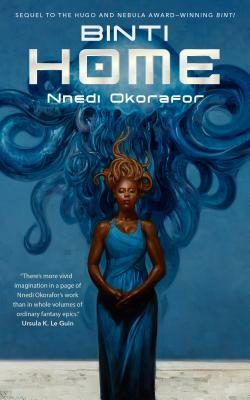 Nnedi Okorafor, born to Igbo Nigerian parents in Cincinnati, Ohio on April 8, 1974, is an author of fantasy and science fiction for both adults and younger readers. Her children's book Long Juju Man (Macmillan, 2009) won the 2007-08 Macmillan Writer's Prize for Africa, and her adult novel Who Fears Death (DAW, 2010) was a Tiptree Honor Book. She is an associate professor of creative writing and literature at the University at Buffalo.